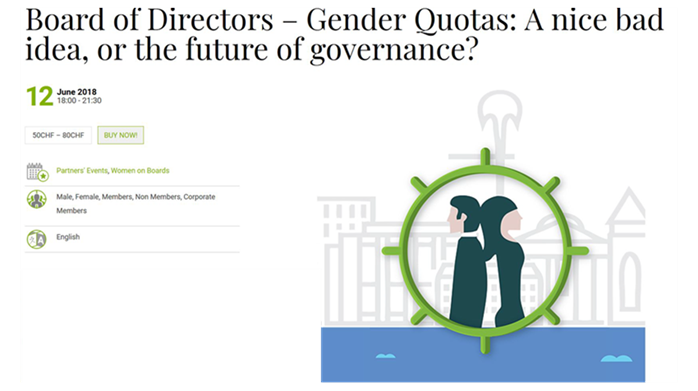 Jun 12 Board Gender Quotas: A nice bad idea, or the future of governance? INSEAD alumni in Switzerland are invited to the second edition of the Career Women’s Forum (CWF) Women on Boards panel discussion series in Geneva on June 12, 2018. The invitation is enabled by the partnership between INSEAD Women in Business Club of Switzerland (IWIB) and CWF. INSEAD NAA members will receive CHF 30 off the wob non-member ticket price. To benefit, send an email to events@insead.ch to request the coupon code and registration instructions (pdf). Board Gender Quotas: A nice bad idea, or the future of governance? This year’s panel will cover the heated debate on the participation of women in corporate and public boards. Why does gender equality and diversity matter for corporate boards? Are you for or against gender quotas? Panel moderated by Michael McKay, Founder and Presenter “The McKay Interview”. Registration: email us at events@insead for registration instructions.